Residents of St. Paul Trinity, a Graceworks Housing Services property in Maysville, Kentucky, were recently treated to a visit by area high school students. 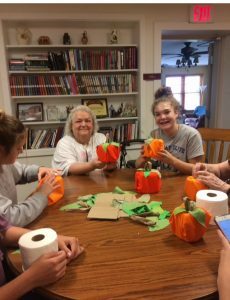 The Health Occupations Students of America (HOSA) participants helped residents make Halloween-themed toilet paper covers. 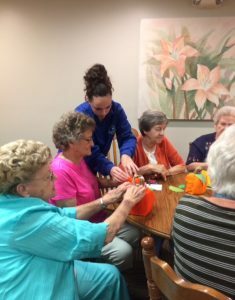 The students brought supplies for the craft and taught the residents how to make the little pumpkin covers. After the art project was completed, the students stayed and enjoyed an afternoon of fellowship with the St. Paul residents, sharing laughs and conversation. The residents invited the students back for the holiday season. The group is planning on doing another craft together during Christmastime.